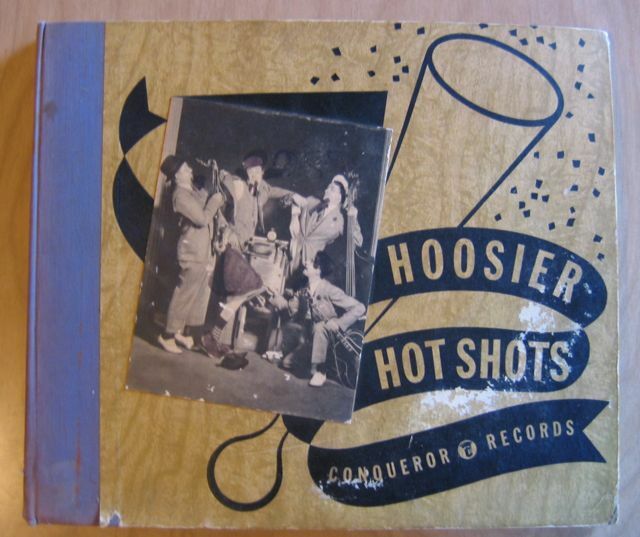 If the term “novelty song” did not already exist, it would have to be coined to describe the repertoire of the Hoosier Hot Shots, a quartet that amused audiences for years broadcasting as an act on the National Barn Dance. They were known for such songs as “I Like Bananas Because They Have No Bones” and “When There’s Tears in the Eyes of a Potato”; and for beginning their numbers with “Are you ready, Hexxie?” to which Hezzie replied on a slide whistle, “Wooo-wooo-wooo-woohoo!” It cannot be doubted that they were an inspiration for Spike Jones and His City Slickers, who were damn funny, but never so funny or meaningful as the Hot Shots at their best. 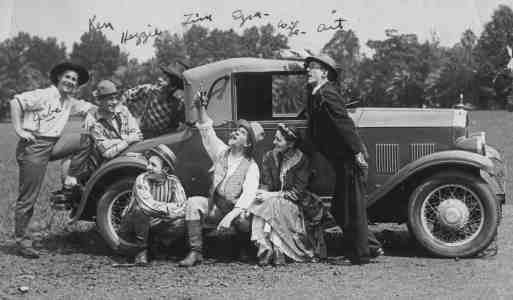 The Hot Shots were begun by two brothers, Kenneth and Paul (Hezzie) Trietsch, who grew up in a musical family on a farm near Arcadia, Indiana (north of Indianapolis). The brothers began their career by touring in vaudeville with their banjo-picking father. When the father retired, the brothers joined an outfit called the Rube Band, where they became friends with a fellow Indiana musician, Charles (Gabe) Ward. When vaudeville succumbed after the 1929 stock market crash, the Rube Band broke up, and the Trietsch brothers and Ward found a nest with WOWO in Fort Wayne, IN, where an announcer first named them the Hoosier Hot Shots. In 1933 they were picked up by WLS in Chicago for a daytime local program and the National Barn Dance, broadcast over NBC, where I heard them every Saturday night for years. The following year they were joined by a fourth musician, Illinois native Frank Kettering, also an alumnus of the Rube Band. The Hot Shots’ fame took them to Hollywood in 1937, where they appeared in more than 20 Western movies, in some of which they were the stars. During World War II the Hot Shots made tours for the USO, appearing in North Africa and Italy. Frank Kettering left the group in 1944 for the military and was replaced by Alabaman Gil Taylor. When television came along, the Hot Shots were ready for it. But by 1960 their popularity had waned, though they continued performing until Hezzie’s death in 1980. In my book the Hot Shots performed many good songs – I like especially “The Coat and the Pants Do All of the Work (But the Vest Gets All the Gravy)” — but they achieved greatness with only one: “From the Indies to the Andes in His Undies,” and then only in the full three-stanza version which I heard so often on the National Barn Dance. Over the years I listened to some LPs of Hot Shot collections, hoping to hear it again; but the original version was never, so far as I have been able to discover, recorded. Most recordings I have heard give only the first and second verses; a few, only the first and third. To make matters worse, the Hot Shots, apparently not realizing that they had produced a masterpiece and that tinkering with perfection only makes it less perfect, revised the song frequently. In some versions General Boo is replaced by Otto Zilch. ‘Twas a very very daring thing to do. Gen’ral Boo, he will surely enter hist’ry’s pages. But they didn’t fit him well – they were his auntie’s. ‘Twas a very very foolish thing to do. Big Chief Boo, he will surely enter hist’ry’s pages. We’ve forgotten what his name is, please excuse us. ‘Twas a very very silly thing to do. There may perhaps somewhere be as good an embodiment of the adage “Fame is fleeting,” but it would be hard to find a better one expressed as economically. The feat itself is specified in the first stanza; in the second the legend is shown in decay because the hero’s name is incorrect and his achievement is ridiculed; and in the third he is forgotten. How true! Go out on the street and ask the first 100 people what Admiral Richard E. Byrd was famous for during his lifetime. You will get 75 blank stares, 24 wrong answers, and only one white-haired old gentleman, tapping his cane on the pavement, will recall Byrd’s South Pole adventure. From the Indies to the Andes – what a mission! And he went without a copyright permission. John Lithgow performed a version of the song on his 1999 album “Singin’ in the Bathtub.” Those interested may find much Hotshotiana available for sale (and some for free) at www.hezzie.com.